Coffee is one of the most popular drinks in the world. It is consumed regularly by one third of the world’s population, and consumption continues to rise steadily. At the turn of the 1900s, world exports totaled about one million tons. But by 1950, that figure had doubled. Today, several million tons of beans are exported worldwide, making coffee the second largest item of international commerce after petroleum. Americans presently put away a large chunk, more than the entire world drank just a half century ago. Coffee is, to say the least, an institution in this country, with the average American gulping down two and a half cups daily. You won’t have to look far to find someone who insists he couldn’t live without it. And speaking of institutions, in many states, the coffee break is not only a fixture in almost all offices and factories, it’s dictated by law. Still, Americans are not the heaviest coffee drinkers, the average Swede consumes close to thirty pounds of coffee each year. In fact, in much of Western Europe, the word for coffee, “café”, has become synonymous with an eating place. Even in this country, we prefer to call our beanery a coffee shop, a coffee house, or a cafeteria, which literally means “coffee store” in American Spanish. Americans and Europeans may be avid consumers of the brew, but it’s likely that most Western coffee addicts go through their lives without once laying eyes on a coffee bush. The reason is that coffee simply won’t grow in the climate of Europe or the United States. The coffee plant is a tropical evergreen shrub indigenous to the eastern hemisphere. Twenty five species grow wild in Africa, Asia, and the Near East. Oh, and there is some coffee grown in the US, but only in Hawaii. Most coffee shrubs flourish best in year-round temperatures of from seventy seven to eighty eight degrees F. A temperature dip to around thirty two degrees will kill most coffee plants. And many species require more than sixty inches of rain each year. Two species of the coffee plant are far and away the most common. Coffea Arabica, the oldest known variety, hails originally from Arabia or Ethiopia, and is now grown extensively in South America. Coffea Robusta originated in East and Central Africa and is still the major coffee plant of that continent. Robusta is not, well, “robuster” than Arabica. Actually, it’s milder in taste and aroma, and is less favored by Westerners, but in recent years, Africa has become increasingly important as a coffee exporter. The average coffee shrub grows to a height of about thirty feet, with white flowers and red, fleshy fruits. Each fruit contains pulp and two seeds, and it is the seeds, not “beans”, that is used to make the brew. Why? Caffeine, of course. Caffeine is an alkaloid that mildly stimulates cerebral and cardiac activity. In short, it’s a pick-me-up. Try to imagine the differences in American offices and factories if the drug was suddenly to disappear, for caffeine is often the oil that makes the American brain run smoothly. And not without its price, caffeine causes gastric acidity and nervousness as well as a heightened cardiac action. But coffee-swillers, take heart. Though theoretically the drug can be fatal in large doses, there is no case on record of a caffeine overdose. Oddly enough, though coffee is today a fixture from Titicaca to Timbuktu, the beverage was virtually unknown in most of the world just a few centuries ago. For years on end, the tribesmen of Ethiopia and Central Africa crushed coffee berries and mixed them with animal fat to form balls they devoured before their war parties. The Africans also made a wine from the coffee fruit, though they never brewed a hot beverage. According to some historians, the Arabica shrub was taken to Southern Arabia for cultivation sometime before the year 600 AD, though the Arabs didn’t learn how to brew the hot beverage until the tenth or eleventh century. The word “coffee”, by the way, comes to us either from the Arabic “qahwah”, or from “Kaffa”, a province in Ethiopia that is reputedly the birthplace of the Arabica plant. Arab legend maintains that the coffee bean was actually discovered by goats. According to the tale, a goatherd named Kaldi living around the year 850 was puzzled one day by the queer antics of his flock. After watching them cavort around the fields on their hind legs, the goatherd discovered that the animals had been nibbling on the berries of a wild shrub, and decided to sample the fruit himself. The snack produced a delightful sense of exhilaration, and Kaldo went on to loudly proclaim his find. Once the Arabs had learned to brew a hot beverage from the fruit, coffee became very popular on the Arabian peninsular, especially in connection with long Muslim religious services. Orthodox priests soon pronounced the beverage intoxicating and banned its use. But still the dark brew spread throughout the Near East. Venetian traders were probably the first to bring coffee to Europe. During the sixteenth and seventeenth centuries, the beverage reached on European country after another. In many places, coffee was banned for a while because of religious, political, or medicinal objections. The Italian clergy at first opposed the drink as the beverage of the infidel, but after Pope Clement VII tasted the brew, he proclaimed it fit for Christians. Coffee became widely popular in London during the seventeenth century. The first coffee house opened its doors in 1652. Soon coffee houses became the centers of political, social, literary, and business life in the city. In America, the first popular coffee houses opened as early as the 1680s, and the Mayflower listed among its cargo a mortar and pestle to be used for grinding coffee beans. At that time, almost all European coffee was imported from Yemen and Arabia, since the Arabs has jealously guarded their coffee monopoly by forbidding the export of fertile seeds on pain of death. But around 1700, Dutch traders managed to smuggle some coffee shrubs out of Arabia, sending the embezzled botanica to the island of Java, then a Dutch possession. The growth of coffee plants in Java soon became so prolific that the island’s name became synonymous with the brew. The French, too, managed to get their hands on the coveted shrub, and established coffee plantations in many of their colonies. One coffee plant brought to the Jardin des Plantes in Paris is reputed to be the father of all Latin American coffee. The Dutch and French both founded huge coffee plantations in the Guianas of South America, and like the Arabs, tried their best to guard their prize crop. But according to some accounts, a dashing Brazilian officer won the heart of the wife of the governor of French Guiana. As a token of her affection, she gave him some of the precious beans and cuttings. Brazil began coffee cultivation in 1727, and was to become the largest coffee growing nation on earth. From its introduction there in 1658, coffee was the major crop of Ceylon (now Sri Lanka). In 1869, a terrible blight wiped out the entire Ceylonese crop. Forced to start again from scratch, the Ceylonese decided to give up coffee and plant tea instead. Today, tea is the principle crop of the island. 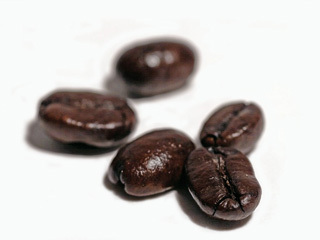 Coffee is the major export crop of many of the countries between the two tropics. A price drop in coffee can throw the economy of many nations in turmoil, as happened in Brazil between 1925 and 1935. After Brazil, Columbia is the world’s largest coffee exporter. Brazil once accounted for 66 percent of all coffee exports, but as African production has continued to rise, that figure has dropped to 40 percent. Today, about 30 percent of all coffee comes from Africa. The rarest coffee in the world is Jamaica Blue Mountain. That particular coffee is sold in only a few stores in the United States. Only 800 bags, or 100,000 pounds, are produced each year. Roasted coffee beans can be brewed into a beverage in dozens of ways, but basically, there are two methods, decoction and infusion. In decoction, the brew is produced by boiling the coffee until its flavor is extracted. In an infusion, water near the boiling point flows over unheated coffee grounds. Americans prefer their java brewed by infusion with either a drip pot or a percolator. The brew is then mixed with milk and sugar. The residents of France prefer café au lait or “latte”, and equal mixture of strong coffee and warm milk. Many Europeans prefer espresso, a strong infusion drink without milk. Cappuccino is a combination of coffee and frothy milk with nutmeg or cinnamon added. Turkish coffee is a heady, usually bitter decoction made from strong aromatic bean. Viennese coffee is usually served with a large dollop of whipped cream. And Irish coffee, a mixture of coffee, whiskey, and whipped cream, can be good to the very last drop, even if you don’t like coffee. Many urban Americans, especially Easterners, are fond of iced coffee, a beverage that has become popular nationwide. And speaking of ice, there’s coffee ice cream. Coffee is also used in some chocolates, and caffeine is an important ingredient in another American institution, Coca Cola. For those who don’t care for caffeine, there’s de-caffeinated coffee, a brew made from ground coffee with all but about two percent of its caffeine removed. And for the real caffeine hater, there are coffee substitutes made from chicory and other herbs. Postum, a popular American drink for more than 75 years, is made from bran, wheat, and molasses. While we’re on the subject of caffeine, the often heard idea that caffeine is an effective antidote to inebriation is simply without grounds. Time is the only remedy for excess alcohol in the blood, so coffee is an aid to the intoxicated only insofar as it takes time to drink it. 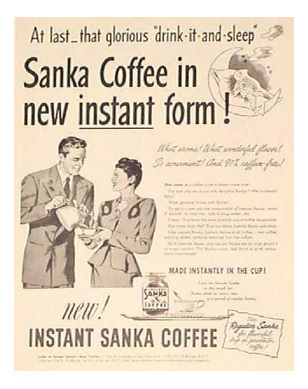 Instant coffee is actually brewed in the factory and reconstituted in the home. In the spray-drying method of manufacture, a concentrated brew is sprayed into a chamber with hot dry air, The air carries off the moisture, leaving behind the particles you find in your jar of instant. In the freeze drying method, a coffee extract is frozen and introduced into a vacuum chamber, where the moisture is sublimed and a solid mass left behind. The mass is then reduced to granules and packaged for those coffee lovers for whom time is more important than taste. The debate between the instant coffee connoisseur and the fresh brewed fancier will probably go on forever. Which makes sense, since among Americans today, there seems to be no middle ground, you either love coffee or you hate it. If you number yourself among the coffee crazy, drink hearty, and the next time you pour yourself a cup of java, give silent thanks to an Arabian goatherd and his errant flock. Where Did Coffee Come From and Who Were the First People to Discover and Drink Coffee? How is instant coffee made and Where does instant coffee come from? Who invented coffee and How did people learn how to make coffee?